Raku and Kosaki Onodera have been outwitted by Kosaki’s mother and are now forced to have a private stay at her aunt’s resort together! Unfortunately with so much unsaid between these two it looks more like an uncomfortable situation than an opportunity for Kosaki finally confess to Raku. Meanwhile at school, Raku’s childhood friend turned homeroom teacher Yui Kanakura is super popular, but it seems like she’s taken on a little more than she can handle between her teaching and running the Char Sui Kai crime syndicate. After she collapses in front of Raku at school, it falls on him to look out for Yui! Later, it’s class-trip time for the gang as their class heads to Kyoto, but Raku’s usually good luck runs out when he’s place in an all-guys group! With Raku away from his friends, the game is on for the rest of the girls as they try to plot how to spend time with him on the trip. At this point in the series, Nisekoi lives and dies by how well its joke setups work in creating more funny and charming situations to throw this cast of characters into. I wouldn’t say that Nisekoi is a pure slice-of-life at the moment given the way that it is slowly inching towards some sort of conclusion, but it’s hard to deny that it has definitely been in situational comedy mode for a number of volumes now as Raku’s high-school days pass by. This isn’t necessary a bad thing though, and Nisekoi Vol. 16 actually ended up being one of the strongest recent volumes in this series because of the way that was able to put a hilarious and heartwarming spin on the situations these characters have been in to entertaining effect. Nisekoi Vol. 17 is a much more mixed bag in how well it succeeds creating interesting and funny scenes because a number of the scenes end up more on the predictable and forgettable side of things. Nisekoi Vol. 17 is more or less book ended by two segments which feature Raku with Kosaki Onodera as they continue their overnight stay at Kosaki’s aunt’s house, and later as they struggle to reach the class trip. Although we get a modicum of progression between the two as Raku *finally* realizes that he was her first love after they bump into each other in the hot spring, but it’s unfortunate that as usual this doesn’t amount to much at all. These two scenes also continue to use their mutual embarrassment around each other for humour, but at this point in the story it feels incredibly played out because it always tends to unfold exactly the same way. It also didn’t help that both of these scenes featured the two of them together alone without any of the other characters to get things happening, and in hindsight it seems a little bit worrying that the funniest bit out of these two segments was a quick cut to Marika’s reaction to finding out the two got lost together. Overall, these segments were forgettable especially in comparison to how funny a number of the comedic moments in the previous volume were, and I hope that Komi-sensei doesn’t resort to the format used in these segments anymore with a serious expectation that it will be worthwhile. The addition of Yui in volume 14 really helped to shake up the story in a fresh way, and her character development has been fairly interesting in terms of establishing her place in Raku’s circle of relationships. The principle story of this volume follows Yui and Raku after Yui faints from overwork at school, and this is used as an occasion to explore some more of Yui’s driving motivations. This ends up being a surprisingly compelling look at her reasons for being so attached to Raku, and I thought that this was helpful in adding some context to her general presence in the story. This is especially true in comparison to Kosaki and Tsugumi’s rather under-contextualized romantic feelings for Raku which seemingly popped out of the blue, and I thought that this little subplot helped to establish Yui’s place in the story a little more concretely. It also helped that Yui continues to be one of the more entertaining members of Raku’s friend-group because of her general spunkiness and willingness to push the envelope with him a little bit, and this made for a relatively lively story that felt like it really added something to the plot (as opposed to the Onodera sections I complained about above). 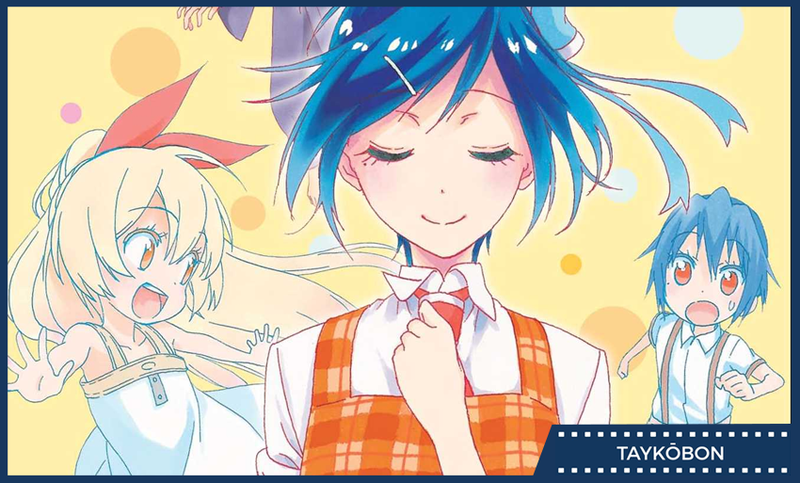 Although the other girls are largely out of the spotlight in this volume, we do get some scenes with Chitoge and Tsugumi in a couple of smaller one-off chapters. (Sorry Marika fans, no dice in this volume) The first of these follows Chitoge and Raku teaming up during the three-legged race at the school’s athletic festival among other events. Naturally with Shu’s intervention the other girls get involved to racy effect, but this chapter ends up more or less being filler in giving the fans of each of these girls a bit of face time with not a lot clever going on here.Tsugumi gets a chapter focused on exploring her backstory with regard to her childhood with Chitoge, but I think this chapter missed the mark a little bit in the sense that it seemed to repeating a number of the same emotional beats that have already been covered pretty extensively so far in the series with regard to Tsugumi’s attachment to her mistress. The final chapter of this volume follows Chitoge as she tries to sneak out to see Raku at night during the school-trip, and this was a cute little interlude that featured a few funny expressions on her part. The art in this volume is of the same high-quality as the rest of the series, and although the expressions aren’t quite as memorable as the previous volume (which is admittedly unlikely to be topped soon) I enjoyed it on the whole. Nisekoi Vol. 17 is more of a mixed-bag especially after following the very strong previous volume, and I definitely don’t see it winning over anyone who isn’t already invested in these characters or this series’ particular brand of comedy. The highlight ends up being the exploration of Yui’s character which ends up coming off more meaningfully than other times where Nisekoi has tried to do a bit of a character-study, and I continue to enjoy the addition of Yui to the cast. In comparison, Onodera’s scenes come off as retreats to the same emotional and comedic points that been beaten down with numerous times before, and Tsugumi’s little side-story is a little bit on the perfunctory side in telling us things of minor interest without much reason. If you’re a fan of the series then there isn’t any reason not to pick this volume up, but I found this volume a little wanting after the excellent previous volume. Nisekoi Vol. 17 was translated by Camellia Nieh and published by Viz Media on September 6th, 2016. Authored by Naoshi Komi, the series currently runs in Shueisha’s Weekly Shonen Jump magazine.